Sample the sophisticated charms of the Ferrero Brushed Steel Bar Stool Black, a modern design with the comfort of a dining chair. The ideal place to sit back and relax at your breakfast bar or kitchen island, the Ferrero Bar Stool is a thing of beauty. This breathtakingly understated design combines the comfort of a generously padded black faux leather seat with a tall backrest and stylish segmented stitch detailing. The subtle stability of a hand worked brushed steel frame can be found beneath the seat. Height adjustable and able to swivel 360 degrees, the Ferrero also boasts a looped footrest, helping to ensure full body support. Finally, a protective rubber ring traces the rim of the base, helping to keep your floors free from marks and scuffs. "Good quality bar stool, and good comfort"
Excellent stool very pleased with the finish. 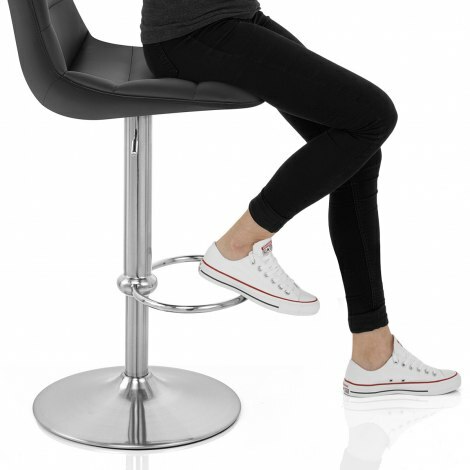 Excellent quality, best thing about this bar stool is that it is great for people with back issues, I can sit comfortably for hours! These stools are of high quality, very comfortable and stylish. Delivery was the next working day. I was looking for very comfortable and stylish bar stools for my newly renovated kitchen. Atlantic had a very extensive range of stools in different styles and colours. My queries were answered promptly by the customer services.The stools arrived quickly and the quality is very good. I found the stools very comfortable to sit. I am going to be ordering another two soon. Very comfortable Bar Stools like sitting in an armchair. Look very smart.